Demolition can be dirty, dusty work. Even a minor smear or layer of grime at the end of the workday can be a mark of pride for a job well done. But too much dust is not a good thing. It is a health hazard and safety concern for workers and bystanders and a threat to environmental quality. 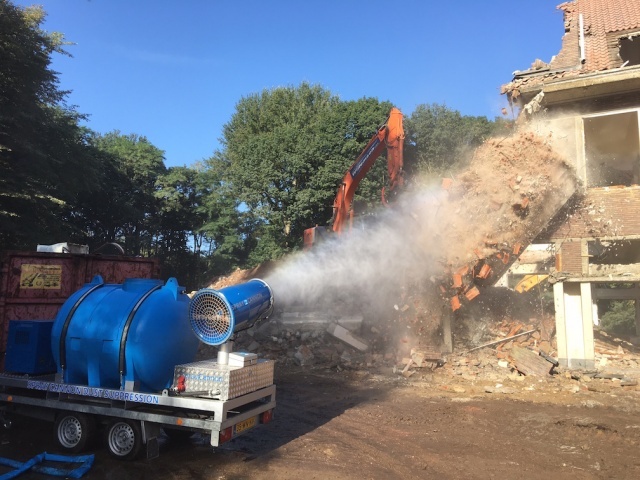 For that reason, water cannons, misters, and other dust suppression systems are not merely an amenity for contractors to offer, they are an essential and, in many jurisdictions, mandatory mitigation tools against those problems. 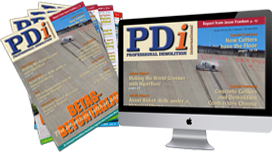 PDi editor Jim Parsons reports on some of the latest innovations. Dust Control Technology has introduced the DustBoss DB-100 Fusion, its largest trailer-mounted dust control system, delivering atomised mist over a coverage area of 15,500m2. The DB-100 Fusion is powered by its own 480V 150kW generator with a 6.8litre John Deere Tier III flex diesel engine, mounted on a dual-axle trailer with stabilising jacks. The unit delivers particle control in a mobile platform that can be positioned directly at the source of dust-generating activities, even on sites without an available power supply. The unit can be specified with a high-lift pump for drawing water from a stationary source. Thought to be the most powerful mobile system available to control dust in large open areas, the DB-100 Fusion has a 567litre fuel tank, providing about 32h of run time without refuelling. Its operation can be managed by the remotely located on/off switch outside of the enclosure. A 120V receptacle for auxiliary tools and a plug-in for the battery charger and block heater are also located outside. To achieve its 100m throw distance, the DB-100 has a 45kW electric fan motor and a booster pump to achieve water pressures of 17.2bar. The DB-100 Fusion uses only about 143.8Litre/min to help avoid pooling or runoff. The unit shatters the inlet stream into millions of tiny droplets in the range of 50-200 microns, an ideal size for suppressing dust particles in most cases. The device can also be customised with alternative nozzle options for specialised applications. The standard DB-100 Fusion is fed by a manifold of 30 nozzles with adjustable elevation from 7° to 45°. It can also be fitted with a dosing pump to meter surfactants or tackifiers to enhance binding of dust particles. The unit can be set to run potable water and fitted with filters to handle non-potable water sources. For applications where water contains high amounts of sediment, additional external filters are available. For operation in cold climates, heaters for the enclosure and heat tracing for pipes are available as options. Multiple automatic drain valves enhance freeze protection. Users can set an oscillation range by the touch screen controls. The standard unit travel coverage is set at 1°/s, and the oscillator has a quick-release handle that allows the barrel to be repositioned in seconds, without using any tools. The touch screen is also used to turn the fan and booster pump on and off, as well as to adjust the vertical pitch of the barrel. When the generator is turned off, a battery backup automatically returns the machine to the horizontal position, which is safe for towing, before it shuts down completely. Fire hoses and couplings are supplied and stored in easy-access tool boxes, along with a spare set of nozzles and basic tools. Maintenance is minimal and the unit has a three year or 3,000h warranty on the dust suppressor and a two year or 2,000h warranty on the generator. Although the unit is typically supplied to run on standard 480V power, customers can specify a range of voltages. Idrotech, part of the Italian manufacturer Idrobase group, has developed the Lince mist cannon/Sparanebbia. The high-pressure system’s versatility is matched by its ease of mobility, given its small dimensions 800mm x 600mm x 1,200mm, relatively lightweight at 55kg, and a trolley. This makes the system ideal for suppression of dust particles in small to medium-sized areas. The Lince mist cannon/Sparanebbia works with a 60bar pressure, 1m3/min flow rate, 250V/50Hz power, and 6m fan jet, which has a flow rate of 2,820m3/h. The ring is fitted with seven nozzles, with a flow rate of 30m3/min to produce a jet of 7.5m. The 30litre tank allows continuous operation for 30min. PJ Tech of South Africa offers the x100 fog cannon for dust suppression and evaporation. With a vertical elevation range of 20° to 45°, the x100’s 84kW engine can throw mist up to 100m in any direction, thanks to a swivel that provides limitless horizontal rotation. This helps eliminate the risk of broken hoses and cables. A variety of nozzle sizes and configurations can create the required misting effect. Portable and raw water sources can be used with the x100, which also features a wireless remote control for safer, more convenient operation. MB Dustcontrol has developed a line of self-supporting SprayCannons equipped with a generator and water dowser, mounted steel skids or integrated on a trailer. This eliminates the need of electrical cables or water hoses running over the ground to the SprayCannon. It is also possible for MB Dustcontrol to produce custom-built SprayCannon. MB Dustcontrol began production of SprayCannons originally for the demolition market, but has since begun customizing products for recycling, quarrying and bulk material handling applications. MB Dustcontrol continuously develops new solutions, installations and improvements such as the stainless steel fixed piping systems for mounting SprayCannons on walls and ceilings. Because SprayCannons encounter erratic weather, MB Dustcontrol uses its own fan technology to optimise airflow. A new option allows users to mount a weather station on the SprayCannon, enabling the operator to adjust the system to maintain efficiency, despite changes in wind, humidity, and temperature. Although other dust suppression manufacturers have adopted rotator technology, MB Dustcontrol continues to utilise a proven system of nozzles. Detailed comparisons of the two systems found that nozzle technology requires less energy and airflow to achieve the desired height and distance. Nozzle systems also provide greater coverage, and are safer because there is no danger from a rotating head. MB Dustcontrol can offer several pumps with different dimensions, capacities, and pressures. SprayCannons can also easily be equipped with frequency valves to fine tune water droplet size and water usage. A filter mounted at the water inlet and in each nozzle eliminates clogging. The 34 nozzles require less maintenance and can be cleaned in about 15min. And the fact that only tips need replacement means fewer spare parts. Earlier this year, Duztech added the compact and lightweight M 30 and M 40 mist cannons to its M-range. Both feature remote control of all functions and low power consumption as standard features, as well as automatic swing operation to distribute the water mist over large areas. The extremely fine water mist generated by both units is highly effective against airborne dust, as well as humidification when the ground or other surface is sensitive for wetting. M-range cannons are also suitable for odour control using additives and a dosing pump. The process of continuous improvement of Motofog consolidates its role as a reference machine for dust suppression in the demolition industry. While the 2016 version may seem similar to the previous ones, the model has been significantly improved in all respects to meet the growing demands of performance and reliability. For example, 2016 saw the introduction of a new diesel version Motofog D, certified to meet the latest US EPA regulations. This allows Leotech to bring this Motofog system to world markets that apply the strictest regulations on diesel engines, especially the US, Canada and China. Likewise, Leotech introduced two versions of its gasoline-powered Motofog B system, both comply with the same EPA regulations. The entry level Motofog J, Leotech’s most compact unit, now features an electric motor drive that will make it attractive to new segments. Motofog is a nebulised jet dust suppression equipped with an internal combustion engine, which drives the high-pressure pump. The water is sent to the nozzle head, which is lifted by hand or electric movement. The jet can be positioned to a height that does not disturb site activities. Motofog with dual-jet is flexible and suits operators’ requirements. Through a simple manoeuvre, the nozzle jets can be adjusted to a specific range or width to accommodate the operation at hand.